Much reporting has been devoted to the hypothesis that Saudi Arabia held the line on not reducing production in the face of plummeting prices in order to drive US shale oil production into retreat. If history repeats shale oil may actually become stronger, but not right away. Hard to argue is the fact that the US has been placed in the position of becoming the swing producer. In other words US production surges and declines will directly influence the world price of oil. The Saudi’s used to be in that position and this was the primary basis for the OPEC cartel being the determinant of pricing. The US added a million barrels per day (bpd) to the market each year for the last three years. Until late last year this merely made up for declines in other parts of the world. Then Libya added 700,000 bpd late last year and supply went into imbalance with demand. This was particularly the case because China dropped into an unaccustomed single digit growth of their GDP, after a decade and more of double digit growth. That drop in demand in China and elsewhere (India’s growth rate also ratcheted down) combined with US production and Saudi inaction led to a halving of oil price in the matter of a couple of months. Most oil companies have responded with projected reductions in spending. This will slowly have a depressing effect on production. Shale oil has breakeven pricing between $40 and $65. The higher cost prospects and those with restrictive financing conditions will drop out. Also dropping out will be the so-called stripper wells, loosely defined as wells producing less than 100 bpd. That’s right, shale oil wells produce as little as that. In fact the vast majority are well under 700 bpd. This compares to offshore wells producing 50 to a 100 times that. Also, flat production in shale oil requires continuous drilling, due to high rates of decline in production in a given well. The reported plummeting in rig count is therefore more of an indicator of future production decline than it would have been in conventional production. All of this means that shale oil production can be expected to start declining in a matter of months. This will put upward pressure on the price of oil. A new normal may well settle in around $60 by the end of the year. But the purpose of this essay is not to predict the future on oil pricing. I am suggesting that a sustained low price of oil is likely to stimulate innovation. In the decade comprising about 1985 to 1995, the price of oil had sunk and rig counts went from 2400 in 1985 to a flat 700 or so in the early nineties. Forced to profit in a low oil price market (oil companies affected) and low rig count market (service companies impacted), industry, and the service companies in particular, responded with a basket of technologies that forced down the cost to produce. For interest, the technologies were 3D subsurface imaging brought to the desk top, horizontal drilling and key enablers known respectively as steerable systems and measurement while drilling (MWD). I was directly involved in the development and launch of the last mentioned, so know the period well. The figure below shows the change in cost to produce over that period (undiscounted). Service company profits were high because value pricing was available for that sort of gain. The company in which I worked had revenue increases in the period 1987 to 1994 of about 7 times, and EBITDA increases with an even higher multiplier. Will history repeat? The reason to respond in the affirmative is in part that the industry has been living on borrowed time in this sector. In some ways the industry has been fortunate to profit while employing essentially brute force techniques. Many in the public believe that shale oil and gas spawned horizontal wells and hydraulic fracturing. Not so. Horizontal wells hit the ground running in the period mentioned above and fracturing had been going on for decades prior to that. In point of fact the technologies are being deployed in a very inefficient manner except for significant efficiency gains in the drilling process through pad drilling (closely spaced wells on a small footprint with rigs moving quickly on rails). In particular, the reservoir is not being well managed. Up to 50% of fracturing zones can be non-productive. Only about 5% of the oil in place is currently being recovered. New wells decline in production up to 70% in the first year. All of these can be attacked with a high likelihood of success. Again, the most likely players in this are the service companies in part because the vast majority of shale oil and gas is being produced by small players with little or no research capability. This is my first mention of gas. Shale gas will also profit directly from technology gains in the areas mentioned. If history does repeat we could expect the breakeven price for shale oil to drop to $30 and below. If that comes to pass, and industry responds predictably, and the reserves are in fact there, the world will be awash in oil again. Market forces of supply and demand will control and OPEC will cease to be important. In addition, I would add these potential efficiency impacts: constrained H2O use; CO2 substitution; 4D technologies; professional turnover (retirement); flex tubing; automation of E&P; staging intervals, drill bit enhancements; telemetry embedded casing; pipeline and storage leak reductions; LNG shipments; globalization of methane distribution; capital demand alternatives. You know far better than most of us how these productivity enhancements may change the E&P world. The indies should prevail in a tussle with the global Bigs. They have less invested per well, can turn the spigot on or off at will and their productivity increases apply at each new well drilled. Rig count also declines with productivity. Cabot revealed in 2/14 their newest Marcellus well that had 10 boreholes from one pad with 140 stages using dual fuel diesels for trucking and pumping and the latest environmentally safe (and approved) lubricants, all at a 25% reduction in production cost. They are profitable at less than $1/Mbcu. Yes, OPEC should become less relevant as global demand begins to match supply. Regional differences will dictate local pricing, as in Europe (why they are buying shiploads of North Carolina wood pellets to substitute for methane in electricity production is quite absurd…). Russia will have to unbundle gas pricing from crude for future delivery or loose continental market share. Finally, IP rates do drop sharply during the first 12 months, agreed. 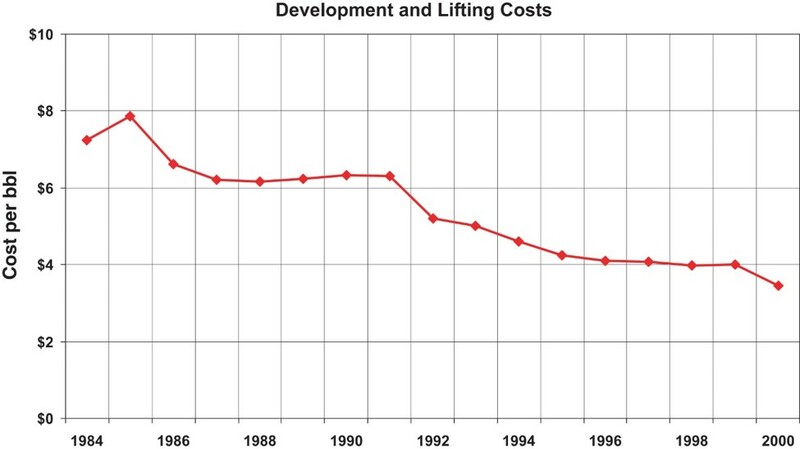 But they drop to ‘normal’ production rates for a vertical well and maintain a similarly steady decline thereafter. Invested capital tends to return in less than 12 months, allowing for ‘risk-free’ returns thereafter. You are currently reading THE OIL SHOCK MAY MAKE SHALE OIL STRONGER at Research Triangle Energy Consortium.